Starting an avocado plant from a stone, or seed, is nearly fail-proof way to propagate a lovely indoor plant with very little expense. When properly planted and maintained, the avocado plant can grow to an impressive small tree with a span of up to 6 feet. Although the avocado plant will probably never produce fruit, it can be a decorative addition to your home for many years. Soak the avocado seed overnight in a bowl of lukewarm water. Soaking the avocado seed will soften the outer coating of the seed, allowing easier germination. Fill a large planting container with damp commercial potting soil. Be sure the container has a hole in the bottom. Cover the hole with a piece of mesh or a broken piece of pottery to prevent the soil from being washed through the drainage hole. Plant the avocado seed in the soil with the pointed end facing up. The rounded end of the avocado seed should be in the soil, and the point of the seed should be about an inch above the top of the soil. Keep the soil consistently moist until the avocado seed sprouts, but don't water so much that the soil is soggy. If the soil is too dry, the avocado plant will drop its leaves. It the soil is excessively wet, the stems will become soft, and can eventually rot. Place the avocado plant in bright, indirect light, and avoid hot, sunny windows. Put the plant a few feet away from a bright window or near a shaded window. Feed the avocado plant every three months. Use an all-purpose liquid fertilizer for indoor plants that can be mixed in the watering can according to the directions on the package. Cut the avocado stem back to about 3 inches when the plant is 6 inches tall. Cutting the plant back will encourage the plant to grow bushy instead of tall and spindly. Stake the avocado plant if it looks tipsy. Place the stake in the soil about an inch from the seed. Tie the avocado plant carefully to the stake, using strips of soft fabric or nylon stockings. 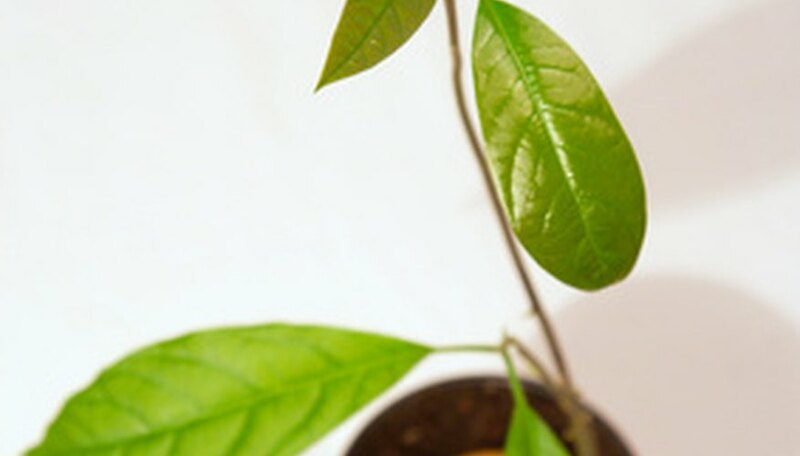 An avocado planted can be started in a glass of water, but the stone will take longer to sprout, and will result in a less durable, smaller plant. To start an avocado in a glass of water, poke three or four toothpicks in a spoke fashion around the avocado seed. Suspend the avocado seed in a glass of water with the pointy end up. Put the glass in a sunny window, and replenish the water as needed.